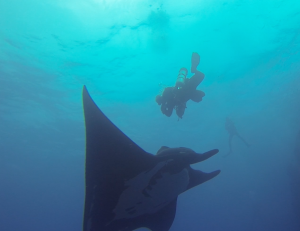 Stare down with a Giant Manta Ray……PRICELESS! Excellent buoyancy control is what every diver should strive for. It defines skilled scuba divers. You’ve seen them underwater. They glide effortlessly, use less air, ascend, descend or hover perfectly still and perfectly horizontal almost as if by thought. They more easily observe aquatic life without disturbing their surroundings, they don’t stir up silt on the bottom because they frog kick and have great trim. You can achieve this style of diving too. Our PADI Peak Performance Buoyancy Specialty course improves the buoyancy skills you learned as a new diver and elevates you towards the next level. Course can be conducted as a group or private course, please contact the store to schedule in your Peak Performance Buoyancy specialty. Determine the exact weight you need, so you’re not overweight, this will improve your trim. Trim your weight system and scuba gear so you’re perfectly balanced in the water and redistribute your weight off the hips if possible. Streamline to save energy, use air more efficiently and move more smoothly through the water with the right fin kicks. Hover effortlessly in a horizontal position. It’s best to use your own scuba equipment so that you fine-tune your buoyancy in gear you’ll use on every dive.Our Staff will help you find the equipment that is best for you and your diving. Want to know more about Peak Performance Buoyancy Course?